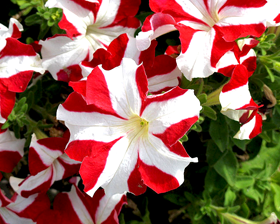 Here is the ultimate colour selection in large flowered single striking bicolor of scarlet Petunias. Extremely uniform, eye-dazzlingly colourful in beds, borders or containers. Height: 20-60cm. Sow January to mid spring at 21-27C on the surface of a good seed compost and gently firm down compost. Keep soil damp but not wet. Do not exclude light, sealing in a polythene bag after sowing is helpful. Germination usually takes 10-21 days.